Our 2016 lawsuit count is complete, and the results no less remarkable than prior years. In 2016, 6,601 ADA Title III lawsuits were filed in federal court — 1,812 more than in 2015. This 37 percent increase continues the upward trend in the number of filings, which we’ve been tracking since 2013. 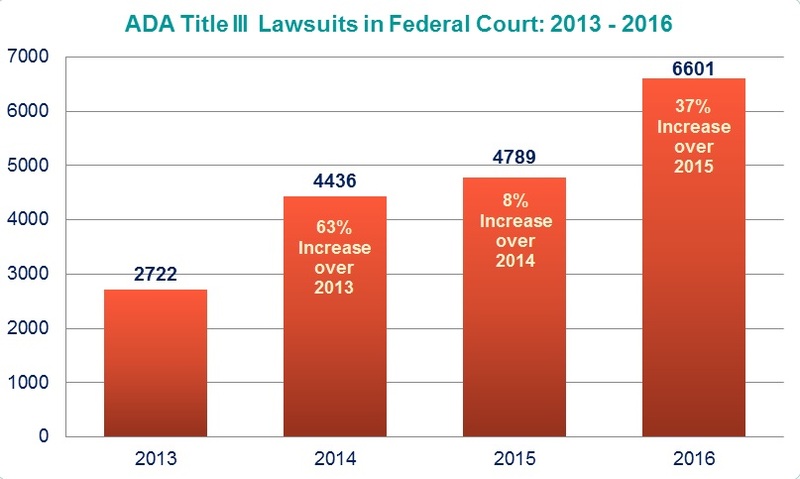 In 2015, there were 8 percent more Title III lawsuits filed than in 2014. The number of cases in Utah jumped from only one in 2015 to 124 in 2016 — due almost entirely to plaintiff Carolyn Ford who filed 105 of those suits. Other states that experienced significant increases include Arizona, California, Colorado, and Georgia. Alaska, North Dakota, South Dakota, and Wyoming are the only states that had no ADA Title III lawsuits at all filed in 2016. What is driving these numbers? While historically there had been a few predictable plaintiffs and attorneys filing Title III lawsuits, over the past year we’ve seen quite a few newcomers filing (the most common) physical accessibility lawsuits, as well as a recent proliferation of plaintiffs and attorneys filing website accessibility lawsuits. There were more than 250 lawsuits filed in 2016 about allegedly inaccessible websites and/or mobile apps. This number does not include the hundreds, if not thousands, of demand letters plaintiffs sent to businesses asserting website accessibility claims. Plaintiffs who filed more than a hundred lawsuits in 2016 were Theresa Brooke (274), Scott Johnson (258), Howard Cohan (251), Lional Dalton (184), Jon Deutsch (175), Advocates for Individuals with Disabilities LLC/Advocates for Individuals with Disabilities Foundation Incorporated, Advocates for American Disabled Individuals LLC (165), Chris Langer (163), Santiago Abreu (152), Damien Moseley (141), Patricia Kennedy (138), Doug Longhini (114), Andres Gomez (113), and Carolyn Ford (105). We expect to see fewer suits from Howard Cohan who was the subject of a news expose in late 2016 which showed videos here and here of him not appearing to be limited in his mobility. Mr. Cohan has filed many hundreds of suits over the years concerning alleged barriers that would affect people who are limited in their mobility. In 2016, lawmakers in both the Senate and House proposed legislation called the ADA Education and Reform Act designed to, among other things, reduce the number of lawsuits filed by serial plaintiffs by requiring them to give businesses notice of the alleged violations and an opportunity to address them before filing suit. Those efforts stalled but may gain new momentum with a new administration that is sympathetic to the plight of small businesses and hostile to federal regulation. There were also state legislative efforts, which will no doubt continue in 2017. We will, as always, continue to keep tracking lawsuit filings, legislative efforts, and other breaking developments and keep you up to date — as the Title III trend shows no signs of cooling down in 2017.